Seventeen-year-old Riley Collins has grown up in some of the world’s most dangerous cities, learning political strategies from her ambassador dad and defensive skills from his security chief. The only thing they didn’t prepare her for: life as an American teenager. After an incident forces her to leave her Pakistani home, Riley is recruited by the State Department to attend Harrington Academy, one of the most elite boarding schools in Connecticut. The catch: she must use her tactical skills to covertly keep an eye on Hayden Frasier, the daughter of a tech billionaire whose new code-breaking spyware has the international intelligence community in an uproar. Disturbing signs begin to appear that Riley’s assignment wasn’t the walk in the park she’d been promised. Now, Riley must fight for her life and Hayden’s, as those around her reveal themselves to be true friends or the ultimate betrayers. 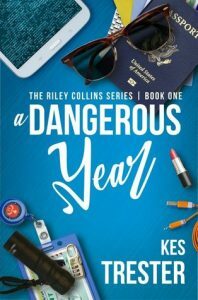 In Kes Trester’s A Dangerous Year, the first in the Riley Collins series, Riley Collins is offered a position at Harrington Academy, a prestigious boarding school in Connecticut. She must, however, use her tactical and diplomatic skills to keep an eye on Hayden Frasier, the daughter of a tech billionaire who’s created a software that promises to uncrack every code and stop wars before they start. Riley is the daughter of an American ambassador, but she’s never truly been immersed in American culture, so the elite world in which Hayden lives is a culture shock for Riley. Riley is smart, however, and learns to adapt and try to fit in as she navigates both high school and her role as Hayden’s security. But nothing is as it seems. A Dangerous Year is a really fun, fast-paced YA spy thriller that I found well-crafted and well-paced. Sure, the idea of a seventeen year old young woman being another young woman’s security requires a little suspension of disbelief, but in the context of the story, it works. Riley felt like a seventeen year old who was highly skilled in some areas and a little socially awkward. 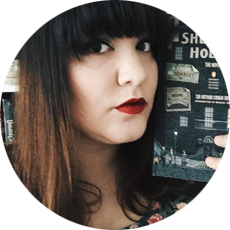 She has to navigate a school with its own weird little hierarchies and try to save the day at the same time, and sometimes that balance is difficult to attain, but Trester made it seem effortless. The only real downside I saw to the whole story was that Riley felt a little too perfect in her skill level, but I hope that will be explored in the next books in the series! Trester’s A Dangerous Year will be great for readers who like high school boarding school stories, Gossip Girl and the like, and Ally Carter’s Gallagher Girls spy series! I received a copy of this book for review from Book Sparks, and all opinions are my own.